The Final Revelation for Trail of Cthulhu collects the four sanity-destroying Purist adventurers by award-winning RPG writer Graham Walmsley. Scott Dorward links them in a disturbing campaign set in Britain in the 1930s, from which there is no escape, no comfort and no salvation when faced with the Mythos; your only choices death, insanity or a quiet life with a shattered mind. The Dance in the Blood: You are drawn to a village in Northern England which is plagued by terrible secrets. Every hundred and nineteen years it is torn apart, its inhabitants massacred. That time has come again, and the monsters are waiting to reclaim their birthright. The Watchers in the Sky: Strange birds watch a paranoid madman, and stare at you from the rooftops. When you dissect one, you find something monstrous inside that reflects a horror within yourself. The Dying of St Margaret's: On a remote Scottish island you take jobs at a private school, each searching for an acquaintance who has disappeared. What you discover drives you to the edge of insanity. The Rending Box: In a London antiques shop, there is a box. Inside is an ancient creature, seeping through to show you everything as it really is: the patterns behind the universe, the monsters older than time, the secrets that break your mind. And all you need to do is open it. 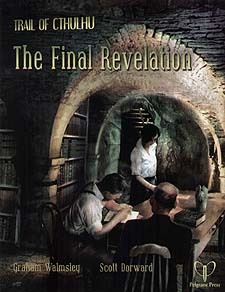 The Final Revelation: As the Friday Group, our Investigators piece together the details of a subtle threat to humanity. Uncovering the facts behind each adventure, you face a final, inescapable truth you could never have guessed. Your friends cannot be trusted, your knowledge means nothing, and everything you hold dear tuns to dust. In the face of madness, in the shadow of the Mythos, dare your Investigators face The Final Revelation?